Searching for Resilience in Sustainable Development: Learning Journeys in Conservation, a new book written by Dr John Blewitt and Professor Daniella Tilbury, examines how resilience may be created within our world’s web of ecological, socio-economic and cultural systems. 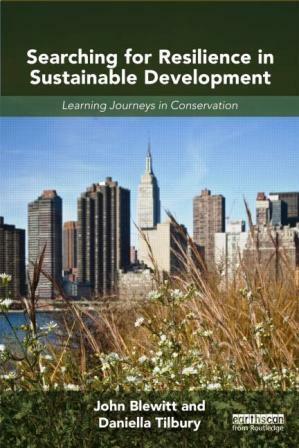 Documenting emerging trends and future pathways for the conservation and sustainable development movement post Rio+20, the book arrives at diverse but connected conclusions and questions related to the resilience of people and planet. Moreover, reflections about education and its contribution to sustainable development underpin most of its chapters. The book will see two launch events in the UK and Kenya. A public discussion and book launch will take place in Meeting Room 1 of the Library of Birmingham on 31 October 2013, 6.30 to 8.30pm, with the participation of a number of organizations, including The Schumacher Institute, Library of Birmingham, Sustainability West Midlands, E.ON, Localise West Midlands, the Royal Society of Arts, Pop Up Foundation, RailTrack/Quest for Solutions, Routledge-Earthscan, RCE Severn (UN endorsed Regional Centre for Sustainability Education) and Aston University. Another launch will be held at the United Nations Environment Programme (UNEP) Headquarters in Nairobi, Kenya on 23 November 2013, coinciding with the International Conference of the Regional Centres of Expertise (RCEs) in Education for Sustainable Development (ESD). Dr Blewitt is co-director of MSc Social Responsibility and Sustainability, Aston University, and a member of the IUCN Commission on Communication and Education. Professor Tilbury is director of sustainability at the University of Gloucestershire and president of Copernicus Alliance of Universities. A good, concise review here. Ideal for mobile surfers like myself.